Few would dispute the fact that the entertainment system of the future will combine the best attributes of both a TV and PC, but debate continues to rage about the wisdom of entrusting all AV needs to a Windows-based Media Centre PC. Tipping the scales of trust are those models configured specifically to handle your precious media files, and designed to look good in the living-room. Such is the MediaPC4U system. Based on the SilverStone Crown CW02 case (available in black or silver), this system looks rather like a high-grade amplifier, and so won't look out of place racked with other AV kit. More to the point, it actually is an amplifier, with a built-in 5.1-channel surround sound processor/amplifier card. The all-aluminium construction and extra-thick reinforced dress plates in the front set off a sophisticated design with a backlit LCD panel and two big control knobs, one for function and one for volume. Front panel sockets are concealed discreetly under a hinged flap. The case is big enough to accommodate an extended length graphics card, a CPU cooler, and lots of drive options. MediaPC4U will assemble pretty much any configuration you want with prices starting at £1,099. Options include a choice of motherboards, Microsoft Windows Vista Home Premium or Ultimate operating systems, different specifications of AMD processor, a choice of coolers, RAM from 1Gb to 4Gb, one to five hard drives of up to 1Tb each, optical drives including DVD-RW, BD and BD-R, a choice of TV tuner cards including dual digital models and the optional SiliconDust HD Homerun dual DVB-T Network Tuner, a choice of Asus and Sapphire graphics cards with up to 1024MB onboard RAM, a choice of power supplies and fans, and a selection of card readers. Phew! All the motherboard options will support Blu-ray and HD-DVD playback, and the system comes with a Windows Vista compatible 56-button infrared remote control handset. Wireless network cards, wireless keyboards, sound-proofing kits and cables are all available as optional extras. The system we auditioned comprises the SilverStone Crown CW02 Media Centre PC Case, MSI Media Live DIVA 5.1 100W (claimed) amplifier CPU, AMD 4850e dual core 2.5GHz processor, Western Digital Green Power 500GB hard drive, LG GGC-H20L Blu-ray optical drive, Windows Vista Home Premium 32-bit operating system, and Arcsoft Total Media Theatre 2 software for native Media Centre Blu-ray playback. We also had a SiliconDust HDHomeRun networkable dual tuner supplied by Nectar Electronics, bringing the total cost to £1,394.73. Naturally, Windows Vista includes Windows Media Center, your control system for playback of digital video and audio files and, of course, you get all the other functionality of a modern PC. The HDMI connection on the graphics card makes it easy to connect to a TV. A rather more fiddly process is the speaker connection for the amplifier card. You have to screw the bare ends of the speaker cable into an edge connector, and plug this into the amplifier board slot, a little awkward, particularly if you have thick speaker cables. The key to the system is the combination of a motherboard and five-channel amplifier that is otherwise known as the Media Live DIVA 5.1. It features a socket to support a range of AMD and Sempron processors, slots for up to 8Gb of memory, and slots for PCI graphics cards. The 5.1 channel audio amplifier circuitry features SPDIF digital and front audio pin outputs, and the video outputs include component video, VGA, HDMI and phono out. PC connections include four SATA II sockets for hard drives, four USB 2.0 rear ports, four USB 2.0 pinheaders, plus IEEE1394 (Firewire), serial port, infrared, CD-in Connector, and LAN connectors. It supports the RAID format should you want to use a massive external drive system. Multi-channel sound processing is handled by the Intersil DAE-3 chip, which, interestingly, is THX Ultra2 certified. 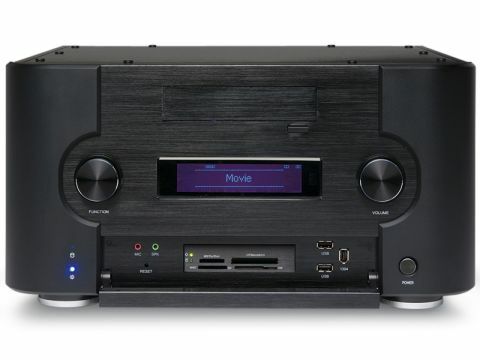 This combines the functions of home cinema audio with those of a traditional video receiver, CD, DVD, DVR, cable box, HD TV tuner, and PC Internet connectivity into a single unit. A five-channel audio amplifier places a high demand on the typical PC power supply, causing voltages to fall and the system processor to reset, but the DAE-3 has a small thermal footprint and real-time power monitoring to prevent this. In use, this multimedia monster is rather sprightly. The AMD Dual Core processor allows multiple programs to be run without stalling or stuttering. This becomes particularly important when you want to watch a TV picture while it is also running other software. The ATI Hybrid Graphics Card combines AMD and ATI Radeon chipsets to take on the load of graphics processing, and to enable multi-display functions. The Arcsoft Total Media Theatre software is intuitive and relatively easy to get to grips with, and I appreciated the provision of a dual Freeview tuner, which allows you to record one channel while watching another; time-shift; pause live TV; and use one-button recording. You can play Blu-ray, DVD or CD discs in the optical drive, all under the control of the remote handset (an onscreen widget replaces the mouse pointer for Blu-ray discs, which aren't mouse-compatible). The front panel has discreet connections including two USBs, one Firewire, microphone and headphone sockets, plus a card reader compatible with SD, MMC, SM, MS and CF cards. Playing Blu-ray discs with the system connected to a 37-inch Panasonic TV, I experienced no picture problems. Discs play smoothly, with image clarity comparable to any mid-priced, standalone Blu-ray player. Sonically, the unit worked fine once we had set the appropriate output options. Operating noise is inoffensive, and can be reduced further with an optional silencing kit. But there are reservations about the fidelity and power of the amplification. Connecting a set of M&K speakers, I found the output to be rather harsh. Separation is fine, though there was a suspicion of distortion at higher volumes. Needless to say, you won't get the kind of audio quality that you'd expect from a dedicated multi-channel amplifier. Having a Media Centre PC integrated with amplification is always going to be a compromise, and you lose a lot of the functionality specific to AVRs (tone control, DSP presets, etc – not to mention superior components, DACs and power supply). The remote control response also seemed to be sluggish, but I'll put this down to Windows. Despite some caveats, this mega Media PC solution has a certain appeal – perhaps in a secondary system or as an AV centre for card-carrying geeks. With its stunning looks and bold integration, it's one of the more impressive systems available, but it doesn't bring an end to the Media Centre debate.